This test kit was designed to give the user repeatable accurate results without sacrificing cost and time. Designed using cutting-edge chemistry, Arsenic Quick™ reports results in only 12 minutes. Additionally, there are no dangerous chemicals needed to run this kit to test water quality. With only one simple test procedure (using 3 reagents), Arsenic Quick is a must for any lab testing water quality, water testing professional, or service technician who values accurate, rapid results without sacrificing cost. 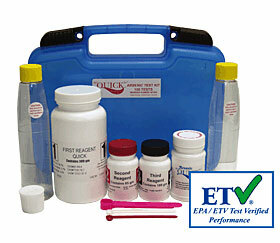 Performance and accuracy of these kits have been verified by the USEPA through the ETV program (www.epa.gov/etv). The tests must be done in a ventilated area. Collect water samples and make sure its temperature is 72°F-84°F (22° - 28°C). Samples cannot be preserved with Nitric Acid or any other preservation method. Small amounts of strong acid will interfere with test results. It is best when test is done within 24 hours from the time of collection. Some water samples over 24 hours may read low. Level of Hydrogen Sulfide above 2 mg/L may interfere with the test. 1. Collect a sample into any available container, make sure it is within a required temperature range. 2. Pour 100 ml into one of the included bottles (with yellow cap). 6. Add a reagent #3. Shake well for 5 seconds. 7. Cap securely with a white cap, provided. Open top of the cap and slide testing strip through. Close the top with strip inside. Wait for 10 minutes. 8. Pull strip out and match the color. Disposal procedure. Discard water from the bottle down the drain that is not used for food preparation, and flush with water. Wet Zinc should be collected and disposed according to local regulations. Rinse the bottle, white cap and yellow cap with clean water. Shake off any excess water and dry white cap with soft tissue - drying white cap is especially important if you plan to run another test immediately. Store used strips in the plastic bag marked "Used Mercury Bromide (HgBr2) Test Strips" (included). Test detects presence of organic Arsenic III As(III), and inorganic Arsenic V As(V) in drinking water. Color matching chart and colored step by step instructions are included.